At our customer we are using Service Bus for Windows Server 1.1 in conjunction with BizTalk 2013. For the setup I followed Paolo Salvatori’s solution, special thanks to him for this great guide! In Paolo’s solution Service Bus for Windows Server 1.0 is being used, so in our case we had to make a few adjustments.The main difference is Service Bus 1.0 uses version 1.8 of Microsoft.ServiceBus.dll, where Service Bus 1.1 uses version 2.1 of the DLL. 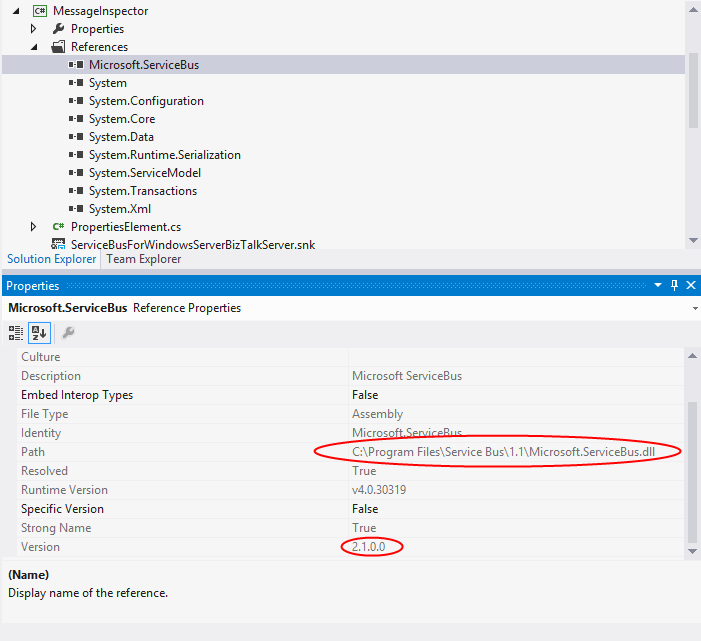 I started by downloading the code, and replaced the references to Microsoft.ServiceBus by a reference to the new DLL in the ServiceBusForWindowsServerBizTalkServer solution. Make sure to import the Microsoft.ServiceBus.dll you used for building the solution, so the 2.1.0.0 version, into the global assembly cache, or you will get an error when trying to import the config file. Once you have done this, you can simply follow the steps in Paolo’s guide to integrate Service Bus with BizTalk. This entry was posted in BizTalk, Service Bus by Eldert Grootenboer. Bookmark the permalink.